Accidental self-inflicted knife injuries to digits are a common cause of tendon and nerve injury requiring hand surgery. Often the injury is to the non-dominant hand as a result of loss of control of the implement while performing a forceful task1, for example removing the stone in an avocado. Avocados have enjoyed a dramatic rise in popularity in recent times. Often referred to as a “superfood” for its high nutritional value, it is enjoyed by health conscious individuals worldwide2. The consumption of avocado per capita in the United States has grown from 2 in 2002 to 7 in 2016. With this rise in popularity, there has also been an apparent increase in avocado related hand injuries. Classically, the patients hold the avocado in their non-dominant hand while using a knife to cut/peel the fruit with their dominant hand. The mechanism of injury is usually a stabbing injury to the non-dominant hand as the knife slips past the stone, through the soft avocado fruit. These stabbing injuries have the potential to cause significant neurovascular, tendinous and/or bony injuries. A recent article published in The Times has coined the term “avocado hand” to describe this injury3. In the article, Mr Simon Eccles, secretary of the British Association of Plastic and Reconstructive Surgery, has called for safety labels to be put on avocados to warn the public of the potential dangers of mishandling them. This has also been published by other media outlets4. Despite their recent high profile, we could not find any cases in the literature which describe the “avocado hand”. We present a case of a 32-year-old woman who sustained a significant hand injury while preparing an avocado. We hope to add to the educational awareness raised by Mr Eccles in the recent media by publishing this classic case. A 32-year-old right-hand dominant female presented to the Emergency Department (ED) with a self-inflicted stabbing injury to her left ring finger. The injury was sustained while she was preparing an avocado. 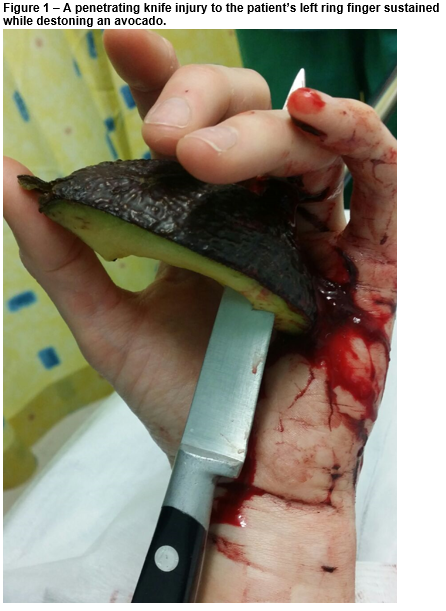 On arrival to the ED, the knife was still impaled through patient’s finger as well as the avocado (figure 1). On examination, there was decreased sensation over the radial aspect of her ring finger. The finger was well perfused with no deficit of the flexor and extensor mechanisms. The knife was removed in the ED after administering digital nerve regional anaesthesia and the wound was washed out. Tetanus and antibiotics were administered. The patient was transferred to theatre and underwent exploration of the wound under axillary block and brachial tourniquet. The radial digital nerve which had been transected was identified and repaired under x3.5 loupe magnification using a 9-0 nylon suture. The patient was discharged the same day. Post-operative recovery was unremarkable with return of full range of motion and an advancing Tinel’s sign noted at last review. The “avocado hand” appears to be resulting in increased emergency and hand surgery department presentations. These patients often present with neurovascular, tendinous or bony injuries affecting their non-dominant hand. This seemingly innocuous slip of the vegetable knife can cause significant injuries, often requiring exploration under regional or general anaesthetic. The public needs to be educated on the potential dangers of preparing avocados. Celebrity chef, Jamie Oliver has released a short video demonstrating a safe method to cut and de-stone an avocado by simply using a chopping board5. “Avocado hand” is a mechanism of injury becoming increasingly more common and public education is paramount in trying to prevent further injuries from occurring. The patient has given their consent for publication of this case. 1. Thorsén F, Rosberg HE, Steen Carlsson K, Dahlin LB. Digital nerve injuries: epidemiology, results, costs, and impact on daily life. J Plast Surg Hand Surg. 2012;46(3-4):184-90. 2. Dreher ML, Davenport AJ. Hass avocado composition and potential health effects. Crit Rev Food Sci Nutr. 2013;53(7):738-50.